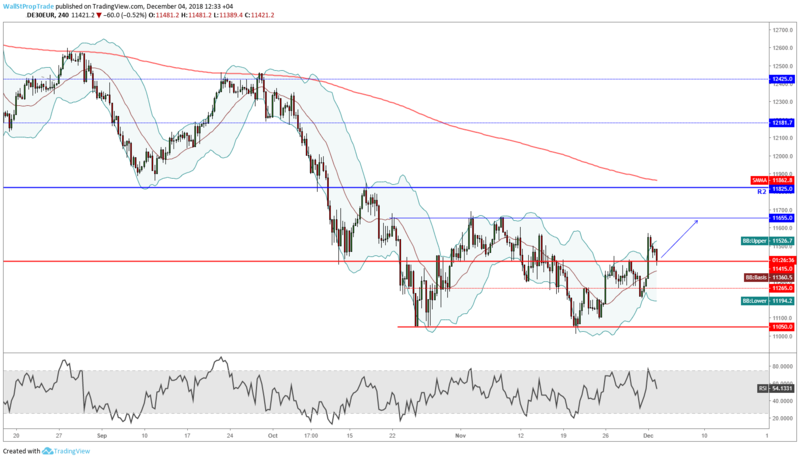 The major European markets showed strong moves to the upside on the day Monday with the German DAX Index shooting up by 1.9% closing at 11465 after the US and China agreed to a temporary trade truce Saturday night. However, there is some confusion on how Sino-American trade negotiations will progress and this is somehow adding to the volatility and uncertainty. It is therefore hard to say whether this trade relief rally will continue for the rest of the week. The German DAX surged yesterday gaining €208 within a single day and breaking the 20-Day moving average for the first time since November 13. The index also crossed the key technical resistance level at 11415 which will now act as support going forward. Further buying might move prices higher should the market test November's nearby high at 11690. Though the index is experiencing a short-term uptrend, this could just be a correction, as both the medium and long-term trends are still bearish.